For a flavorful and easy appetizer, I prepared the following recipe. I have been craving a sweet jam or marmalade to serve over cream cheese. Rather than buying it already prepared, I tackled homemade marmalade, which is much easier than you think! It's a great recipe that you can make in advance and use in various ways. To use, spread on toast, serve with cheese or try it as an appetizer by pouring it over a brick of cream cheese, serving it with crackers. I will warn you that it is quite addicting! 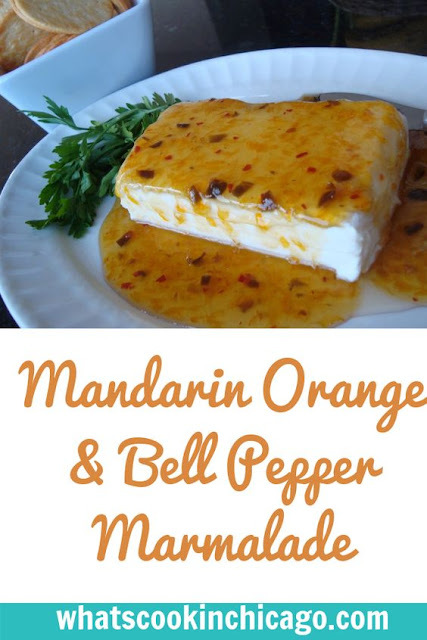 Place the mandarin oranges and syrup in a food processor and process until smooth; place in a medium saucepan. Stir in the honey and finely diced bell peppers. Bring to boil over medium-high heat and cook uncovered until thick and reduced to 1/2 cup, stirring frequently, about 10 minutes. Cool. Season with salt & pepper to taste and with fresh lemon juice, if desired. Now this sounds interesting indeed! We can't get canned mandarin oranges around here, do you think fresh ones would do? i had no idea this was so easy! looks fabulous!